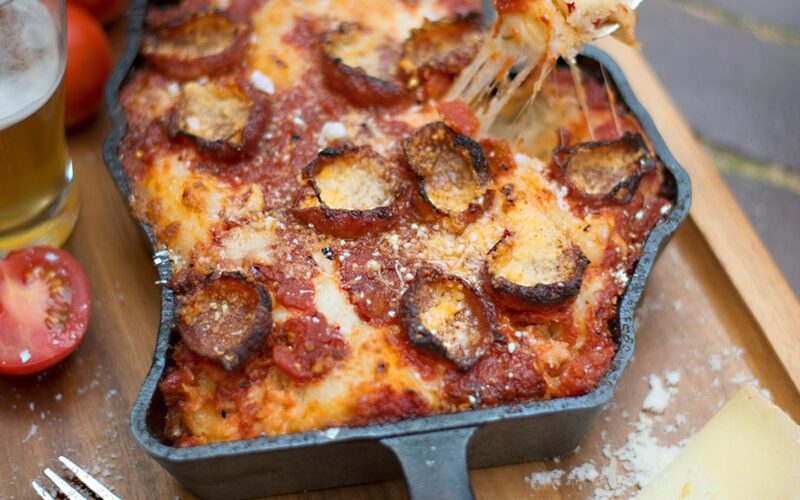 Detroit style deep dish skillet pizza, in a Michigan shaped cast iron skillet. 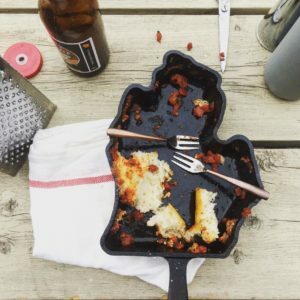 This Detroit Michigan inspired cast iron skillet pizza recipe is for all you thick crust lovers out there that like a crispy outside crust paired with chewy centers for a mouth full of absolute bliss any time of day. Adapted by our hometown hero Jonny Hunter of the Underground Food Collective, from Kenji Alt-Lopez’s “Serious eats foolproof pizza” recipe , this simple dough and sauce combo smelled so good, we could hardly make it through the photo shoot before eating it all! The sizzling awesomeness inside the Michigan skillet’s deep sides was hard to hold back from tearing apart and devouring entirely before it had a chance to even cool. 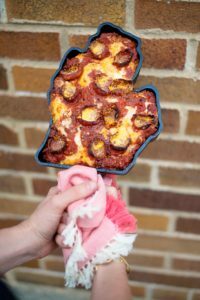 None the less, we managed to get a few shots of the final product, before the mitten shaped pizza waved us all “goodbye!”. Combine flour, salt, yeast, water, and oil in a large bowl. Mix until no dry flour remains. Cover bowl tightly with plastic wrap, making sure that edges are well-sealed, then let rest on the counter top for at least 8 hours and up to 24. Dough should rise dramatically and fill bowl. Flour work surface and transfer dough and form into a ball. Place 1 ball of dough in each pan and turn to coat evenly with oil. Press the dough around the pan until the entire bottom and edges of the pan are covered. Cover with plastic wrap and let the dough sit at room temperature for two hours. After two hours, dough should be mostly filling in the pan up to the edges. Press it until it fills every corner of the pan. Cover with 3/4 cup sauce, Spread evenly with mozzarella cheese, letting the cheese go all the way to the edges. Season with salt. Add other toppings as desired. Drizzle with olive oil. Transfer the skillet into the oven and bake 12 to 15 minutes. The bottom should be crisp and the cheese should be golden. Sprinkle with grated Parmesan or Pecorino Romano cheese.